"We at ULTIMIT Advanced Turnkey Solution are proud to be part of yet another successful story. And we thank Arab American University for their commitment and dedication to make this implementation a Success." 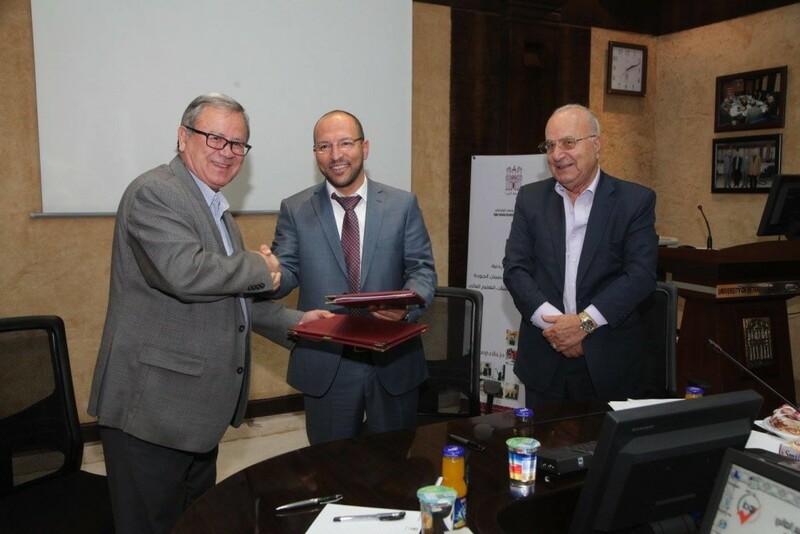 The Arab American University in Jenin has made a highly successful transition to a modern, unified business environment, thanks to Microsoft Dynamics AX. The move has allowed the growing institution to shake off the legacy of its previous finance and procurement set-up, which was split into separate modules from different local vendors, and which made full control and visibility of finance and workflow difficult to achieve. Founded in 2000, The Arab American University (AAU) in Jenin is the first private Palestinian university. AAU provides quality education for students from different parts of the region. Collaborating with California State University and Utah State University, AAU aspires to be a leader in higher education by serving the educational needs of its students within a dynamic learning atmosphere that inspires innovation and personal success. To help achieve its goals, the university aspires to an enterprise-class information technology infrastructure that runs efficiently and serves the needs of 9,000 plus students, supported by a combined faculty and administration complement of 800 other staff. Ayasi and his team report, for example, on the fact that the legacy and bespoke applications were from different vendors, not fully integrated, and functioning as separate isolated silos, therefore were difficult to support and maintain. In addition, data was often duplicated making efforts redundant and information unreliable. A big problem was the mismatch of transacting currency between each application. “A purchase order could start in one currency, be worked on in another, and finally settled in a third,” he recalls. Ayasi contracted for implementation, training and support ULTIMIT Advanced Turnkey Solutions, a successful local Microsoft partner. ULTIMIT carried out a carefully phased approach of the new system functionalities throughout AAU. The client’s journey entailed incorporating Dynamics functionality into everything from accounts payable and accounts receivable to general ledger, budgeting, fixed assets, cash and bank management, project management, all the way to accounting, inventory and warehouse management, and bill of material. As a result, Dynamics AX modules are now firmly at the center of a steadily increasing set of the organization’s business workflows. How is that manifested? On an organizational level, Ayasi sees the process as one of digital transformation, with empowerment of employees perhaps being the most significant. “With the achievement of full P2P (procure to pay) status, our finance, procurement and materials teams all have a full, secure, and highly visible digital method of working that protects our transactions in a very deep way,” he points out. In parallel, he adds, data accuracy, data validation, and data availability have all been radically improved too, approaching 100%, he believes. “Another major pay-back of the move to Microsoft Dynamics has been the almost total eradication of paper out of our workflow,” he adds. That’s being achieved by the improved IT environment the new solution has helped to create along with a move to full electronic document management, he is sure. Ayasi is confident that the original transformation vision has been achieved. “We wanted a unified way to process and control all our financial data, while leaving behind all the inefficiencies our previous systems were causing us. We can track our expenditure and budget much more accurately now; we have definitely managed that with Dynamics and the help of ULTIMIT. ULTIMIT Advanced turnkey solutions signed a new contract to implement ERP and HR systems on Wednesday 3rd, Aug, 2016 with Petra University – Jordan as a step towards Petra Smart University projects. 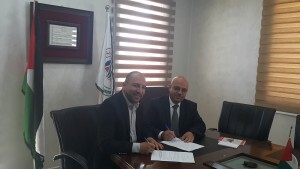 One of Palestine and Jordan’s leading IT companies, the award-winning ULTIMIT Advanced Turnkey Solutions, has become a value-added reseller (VAR) of Laserfiche enterprise content management (ECM) software and a sub-VAR of Laserfiche’s exclusive MENA distributor BMB. 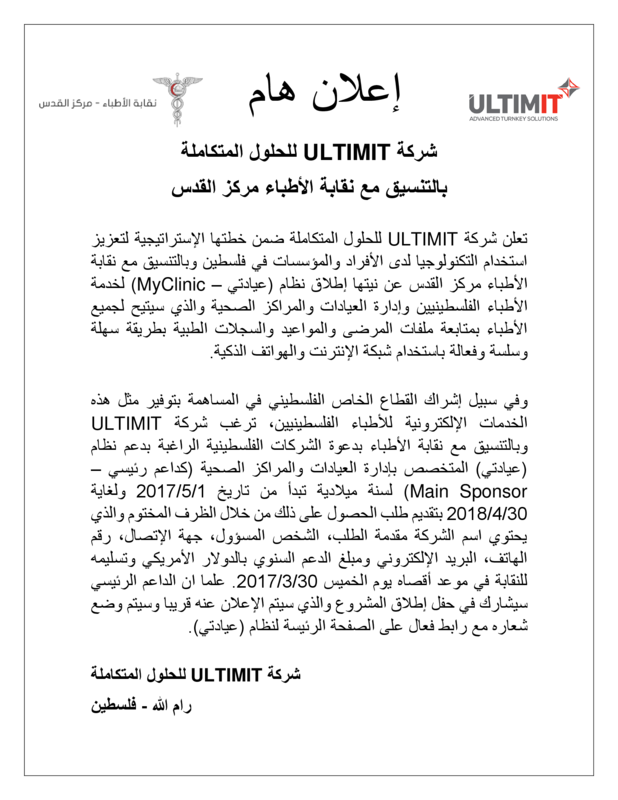 For eight years, ULTIMIT has dedicated itself to providing software, professional services and IT consulting to high-profile customers including the Wataniya Mobile – OOREDOO, Bank of Palestine, Arab American University, APIC Group, PIG Group and Massar Group. “We are excited to bring our customers the opportunity to improve the efficiency and productivity of their business operations by integrating Laserfiche’s state-of-the-art ECM solution with core applications like enterprise resource planning (ERP), customer relationship management (CRM) and human resources management (HRMS),” said Saeed Zeidan, CEO at ULTIMIT. When integrated with core business systems, Laserfiche drives efficiency by enabling employees to easily access content such as scanned or electronic documents, audio-visual files and e-mails through whatever system they choose, including CRM, ERP and HRMS, among many others. Within one month of joining the Laserfiche VAR program, ULTIMIT sold a 65-user Laserfiche system to Palestine’s Arab American University, which will use the software to archive documents and provide records management across departments, faculties and branches. The university also plans to use Laserfiche’s electronic forms solution to automate the forms and processes associated with ISO 9001:2000. Advanced training has already been provided to the university by BMB and implementation is ongoing with the help of BMB’s certified team. +970 2 2414660 (Palestine) or +962 6 580 5370 (Jordan). ULTIMIT is an advanced IT company that is focusing its strategy on providing clients with high quality and reliable state of the art IT solutions. With the help of our selectively chosen experts from all over the world, ULTIMIT is ready to take on any challenge to prove its expertise in providing superior tailored IT business solutions. Our team has over 220 years of cumulative hands on experience in developing, customizing and deploying IT business solutions such as Enterprise Resource Planning (ERP), Customer Relation Management (CRM), Human Resource Management (HRM), Enterprise Document Management Systems (EDMS), Mobile Sales Force Automation (MSFA), in addition to many other custom developed applications for TELECOM, HEALTH, EDUCATION, and PUBLIC sectors. (NAIS) in Palestine. The FAO WBGS has worked since 2002 on the preparation for, and response to, food and agricultural threats and livelihood emergencies in the WBGS through emergency relief, rehabilitation and revitalization of productive capacity. FAO WBGS is implementing the project: “Support livestock based livelihoods of vulnerable population in the occupied Palestinian territory which is funded by the European Union and was implemented in different governorates of the WBGS. One of the main activities of the project is establishing the first National Animal Identification System (NAIS), which was developed through a well-recognized international company. The project was implemented in close cooperation with the Ministry of Agriculture (MoA), including its local branches and departments in both West Bank and Gaza Strip, and other public bodies active in the livestock sector. ULTIMIT’s ServiceSpace is solution that is designed to assist organizations (whether private, public, or non-governmental organizations NGOs) in managing the service, complaint, or suggestion requests in a standardized, repeatable, and measurable way to enhance the organization’s efficiency and accountability. Digitize and centralize files into one secure business content management system. Boost customer service by securely publishing documents to web portals. Improve collaboration with simultaneous document access and versioning. reate, save and share documents from the Microsoft applications employees use every day. This is an international exhibition that covers core topics in today technology solutions, which are ULTIMIT main solutions and products in MENA and worldwide.